These high quality, super reliable in ceiling projector screens represent fantastic value for money, being almost half the price of similar quality branded in ceiling projector screens. We’ve used them in installations across the UK with superb results. They come as 7′ 8′ and 9′ widths with black borders and 50cm black drop at the top. Complete with Infra Red remote control, instructions and mounting brackets. The Cyber Series in ceiling projector screens use a US manufactured high quality multi ply material with a high contrast and low gain of 1.1. The Projector screen material is tear resistant, fireproof, wrinkle proof and is designed to hang perfectly flat. The centre layer is a glass fibre net producing a flex rate of less than 1% compared with the industry average of 33%. The front layer optimises contrast and reflectivity while a black PVC backing prevents light leakage and helps retain a uniformly flat projection surface. 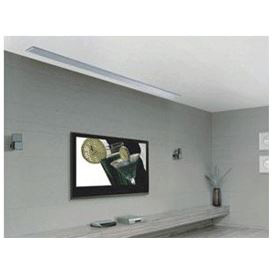 All Cyber electric projector screens feature built in infra-red remote control and come with a simple hand held remote. The IR receiver is a small external IR eye which is simply plugged into the end of the motor unit. Also included is a 12volt trigger input, this allows the screen to be activated from any projector or surround sound amp with a 12volt output. A 10m mono mini jack cable is included to connect the screen to a 12volt output device. The unusually quiet operation is due to the unique way that the motor section of the housing is separated from the ceiling section of the housing by a rubber seal. This stops any vibration travelling through into the ceiling void, amplifying the sound. An issue found with other In-ceiling designs. This along with the trap door mechanism makes this screen the perfect discreet option for projection. The Cyber series projector screens all use SOMFY motors, the same motors found in the likes of Dalite and Stuart cinema screens. Just like televisions, projector screens are measured in imperial feet and inches. The screen is measured by the width of the material from left to right. The standard in-ceiling sizes are 7ft, 8ft and 9ft. The viewable area is the white part of the screen which is slightly smaller due to the surrounding black borders. The Cyber screens top black border can be adjusted from 0 to 20″/50cm to give the desired screen position.